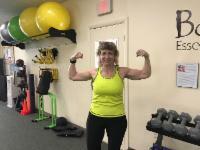 Fitness has been a lifelong pursuit for Julie. 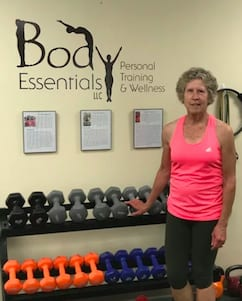 She has worked out for over 30 years and been a member of numerous fitness clubs around Rutland working out and doing some group fitness instruction at different points in time. Getting certified as a personal trainer is a long overdue progression for Julie. She has been a part of the Body Essentials community for over 5 years now coaching clients and passing on her knowledge and passion for fitness to inspire them to reach their own goals. Outside of Body Essentials Julie plays ice hockey in the winter, even leading some of the workouts for her team. She has played hockey for nine years and it is a family affair as her daughter played for Rutland High School for four years and her husband played for a number of years as well. She is an also an active walker utilizing her lunch hour to stay active logging 3-4 miles per day, even finishing in the top 20 at the Corporate Cup 5K challenge in 2017! Lunchtime walks help prevent Julie from being too sedentary at her office job. At home Julie enjoys gardening. Julie got early lessons from her mom (who lived late into her 90’s) about the value of being active in daily life. 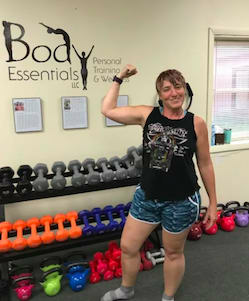 Julie now passes that on to those she trains weekly keeping them strong, mobile, and balanced from head to toe and reminding them of the value of investing in themselves to stay healthy for the long term and prevent chronic illness using a combination of mind and body practices. Julie is a great example of the possibility of prioritizing oneself while also raising a family, caregiving for a parent, and working full-time. She attributes her healthy lifestyle making it possible to stay energetic physically and mentally dealing with the daily rigors of life. 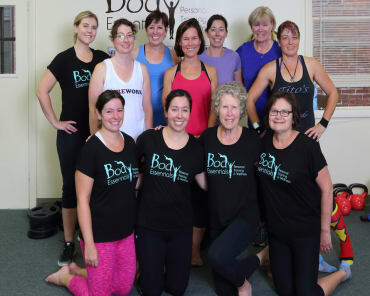 She believes that Body Essentials is the best possible spot to begin your first steps to fitness or make your return to fitness if you truly want a personalized experience while also educating you on overall wellness. 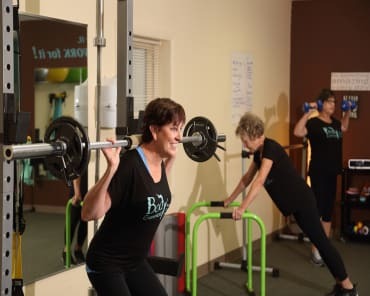 Classes are intentionally kept small in order to provide individual coaching and you are taught exercises that can be used at home with minimal equipment.